Not exactly what I expected, but I'll take it none-the-less. Black Adam is a DC Comics supervillain best known as the antagonist to Captain Marvel aka SHAZAM! As originally depicted, Black Adam was a corrupted, ancient Egyptian predecessor of Captain Marvel, who fought his way to modern times to challenge the hero and his Marvel Family associates. Since the turn of the 21st century, however, Black Adam has been re-defined by DC Comics as a corrupted anti hero attempting to "clear his name". In The New 52 (a reboot of the DC Comics universe), Black Adam was mentioned by Dr. Sivana while listening to witness reports of the wizard Shazam. Sivana mentions that Black Adam was a slave who was teleported from his prison cell to the Rock of Eternity and granted his powers by the wizard. Adam then went on to save Kahndaq from the Seven Deadly Sins before vanishing. During Dr. Sivana's explanation, drawings of Black Adam are shown in a historical text, displaying a slightly different look from his previous incarnations. Dr. Sivana later uses his new-found magic eye inside of some ruins to read a magically hidden hieroglyph that makes the wall explode, releasing Black Adam from his tomb. Adam is then shown in a revamped version of his original costume, which includes a cape, hood, and a metallic belt instead of a sash. His lightning bolt appears as an opening into his body with magical energy visibly inside of him. In Black Adam's subsequent pursuit of Shazam, Billy is shown the beginning of Black Adam's origin. It centers around the story of Aman, a Kahndaqi boy who was thrust into abuse and slavery long ago. Thinking that he can surely relate and connect with another boy who has suffered like he has, Billy (without hearing the rest of the tale) rushes to Black Adam and tries to reason with him. To his surprise, Black Adam simply grabs him and tells him he "knows nothing." Black Adam shows Billy the rest of his origin, which reveals that Aman had an uncle (who helped Aman escape slavery), whose name was Adam. Adam was injured during their escape, and when Aman was chosen by the wizard to be his champion, Aman shared his power with Adam to heal him. Afterwards, although Aman wanted to use his new power to help his people and cure his former slavemasters of their evil souls, Adam only sought vengeance against those who had enslaved them. To this end, when Aman called down the lightning, Adam seemingly killed Aman so that he himself was the sole recipient of the power. However, the details of Aman's "death" are not shown, leaving his fate open to speculation. Black Adam refers to Aman's "sacrifice," and tells Billy that he will go to any lengths to "free this world from those who enslave it." In the finale of Shazam's origin story, Black Adam holds Billy's foster siblings hostage and demands he give up his power or they will die. But instead of giving Black Adam his power, he shares it with his foster siblings, empowering them as "Shazams", as well. Together, they fight Black Adam and the "host" that the seven sins have inhabited. Eventually, the collateral damage endangers civilians, so Billy orders them to save the people while he alone battles Black Adam. He finally realizes that his knowledge of his newly acquired powers cannot defeat Adam, who has much more experience using his magic, and decides to change back into his child form. As normal teenager Billy, he challenges Black Adam to also change (into Teth-Adam) to make it a "fair" fight. After some convincing, he does so, but because he has been alive for centuries due only to his "Black Adam form," as a normal human he quickly ages and turns to dust. During the Forever Evil storyline, revolutionaries in Kahndaq use an ancient scroll to attempt to revive Black Adam so he will be their champion once again to save them from their oppressive ruler. A man named Amon begins to read the ancient spell, but before he can complete it, the military attacks them. Amon, injured, makes his sister Adrianna complete the spell which revives Black Adam. He proceeds to defeat the military forces and kills the Kahndaqi ruler. Acting as Kahndaq's protector again, Black Adam sees the Crime Syndicate's message "The World is Ours" and gets angered saying "this world belongs to no one! When Jimmy Olsen activates his Superman signal when confronted by Ultraman, Black Adam answers the call and ends up fighting Ultraman. Ultraman manages to defeat Black Adam and throw him into the ocean. Black Manta managed to fish Black Adam out of the ocean when he meets up with Lex Luthor. Lex Luthor works on resuscitating Black Adam. When it comes to the final battle against the Crime Syndicate, Black Adam and Sinestro move the moon where the sun ends up weakening Ultraman. In the aftermath of the battle against the Crime Syndicate, it was stated that the villains who helped to stop the Crime Syndicate would have their criminal records wiped. Black Adam and Sinestro didn't care about that and left in their separate ways, along with the other villains. A for the strength of Amon Black Adam has a phenomenal level of super strength, able to easily bend steel, punch through walls, produce powerful shockwaves by clapping his hands, and lift massive objects. Adam's strength is generally depicted of being on levels equal to those of Superman and Captain Marvel, though some writers have portrayed his strength as possibly outmatching them. On at least one occasion, he has been able to hold his own against an assemblage of the Justice League, Justice Society, Great Ten, Martian Manhunter (who has strength depicted as close to Superman) and the Teen Titans. He has recently acquired the Power of the Goddess Isis, making him stronger than ever. When Black Adam utters the magic word he not only gains his usual powers but all of his original powers are greater in strength because of the extra power he gains from Isis. The Power of Isis should also grant him control of nature and telekinesis, although he has not shown these abilities. Saying the magic word again initially changes Black Adam back into Theo Adam, although when the Spectre strips him of his powers during the Black Vengeance affair, he reverts to Teth Adam, the ancient Khandaqi warrior who was Mighty Adam. Subsequent depictions in the 52 maxi-series also showed Teth Adam as Black Adam's default mortal identity. 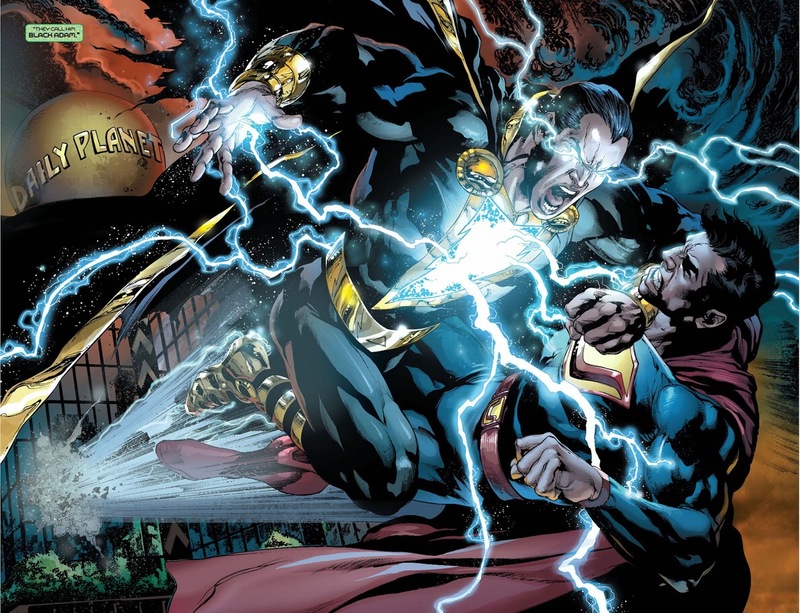 However, Black Adam very rarely voluntarily changes back to his non-powered form.